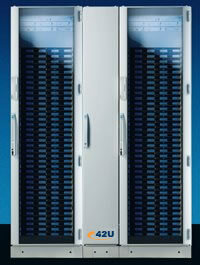 Rittal RimatriX5 solves the problem of climate control for high heat losses per rack with the Liquid Cooling Package. Extremely high heat loads are dissipated from the rack via the LCP air/water heat exchanger Rittal LCP – Rittal Liquid Cooling Package. Data center heat loads have increased dramatically as more components are squeezed tighter into densely packed rack space. Yet most mission critical servers are still being cooled using fans, air conditioners or a combination of the two. Frequent hot spots, rising cabinet temperatures and a patchwork of quick fixes are only band-aids that get around the obvious solution – high density cooling of the data center using chilled liquid. Liquids have a very high thermal capacity (around 3,500 times greater than air) which makes them ideal for removing heat from a data center cabinet. Conveniently, many modern data centers already have a source of cooled liquid readily available. Piping chilled liquid through a Rittal LCP system protects your sensitive components by creating a carefully controlled cooling environment for maximum uptime. 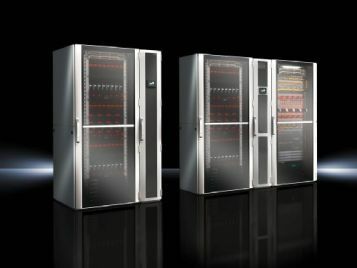 Much like an automobile radiator, a Rittal LCP system cools heated rack components with liquid cooled forced air. 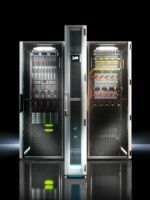 Rittal LCP systems are available in many configurations to tackle the exact heat load needs of your data center. Designed to be installed next to an 80″ (2000 mm) high by 40″/48″ (1000/1200 mm) deep TS8 server cabinet, the LCP Standard can accommodate up to three air/water exchanger modules that can be hot swapped if needed. When fully loaded with three air/water exchanger modules the LCP Standard can provide up to 68,243 BTU (20KW) of useful cooling with a maximum air volume of 1766 cfm (3000 m3/hr). Don’t have an immediate need for that much heat removal? 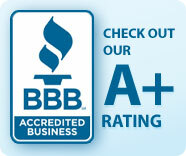 Start with one exchanger module then add more as needed. Ideal for retrofitting, the LCP Extend is installed on the rear door of problem racks. The LCP Extend can be ordered for use on cabinets from other manufacturers. If you are already using Rittal cabinets, the unit comes mounted into the proper replacement rear door which allows you to simply swap it out with the existing rear door. The Rittal Liquid Cooling Packages can accommodate dissipating extremely high heat loads from IT racks via air or water heat exchangers as well as can be ideal for cooling small and medium-sized IT applications. For the highest density installations, the LCP Rack CW units efficiently cool the air path using a closed loop system and maintain a 12-inch wide footprint. With fans located on the front, away from maximum heat, the life of the fans is extended. Create a cold curtain down a row rather than simply moving air into an aisle with either a flush or protruding LCP Inline CW unit. Optimize airflow by strategically choosing and placing this package. at either the top or bottom of the unit!